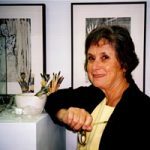 An August 14, 2006 interview of book artist Mary Ann Sampson, by Steve Miller. She explores her roots in printmaking and surface design, and the book as personal narrative. A song “No More Mondays” by Melissa Forbes ends this podcast.